Nepal offers a challenging and pleasant scenic ride from the tropical plains of Terai, mid-hills, mountainous terrain and its lush valleys to the arctic climate of the high alpine region. The only way to discover these hidden treasures and its warm ever-smiling people is on mountain bikes. 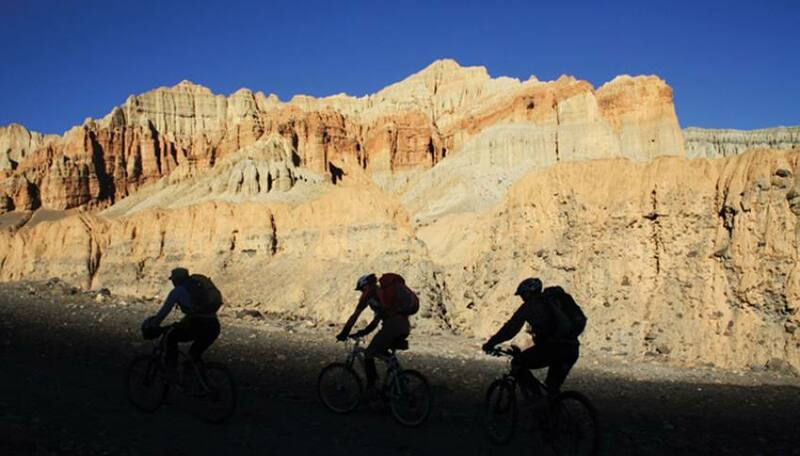 Mountain biking is a great fun and a perfect way to discover Nepal’s great diverse landscape, of tremendous terrain, tracks and trails. Where mountain bike takes you away from the hustle bustle of the city-town life into serene country life, on a hidden trail rarely visited area of local villages, its traditional rural life style that has preserved for centuries. Around the Kathmandu valley the options for mountain biking are endless. You can challenge yourself on long, hilly rides out on the valley rim or just explore the many temples and Newari villages in the lower valley. Or for the less energetic you can have a strictly downhill tour. For the adrenaline seeker there is some really good downhill routes on offer around Kathmandu and Pohkara as well as a newly opened up heritage trail in Langtang to challenge your technical abilities. For the serious rider, there are also mountain bike races throughout the year that are open to foreigners. Please contact us for detail and information. We can tailor any mountain biking trip to suit your needs. Here is a taste of some excellent tours for your Trip.